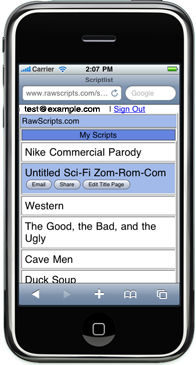 Starting in mid-April, Rawscripts will start using a new login system. Until now, users have been able to log in with just their Google or Yahoo credentials. After the change, all users will need to set up a password for Rawscripts, and you will use that and your email address to log in. The main reason for this change is technical. The technology the site has long relied on (OpenID 2.0) will soon become obsolete. Google will stop supporting this login by the end of April. Yahoo will change its login later this year. Something's got to change, and so now is a good time to set up the new password system (something I've wanted to set up for a while). So for now, please verify your email address, and be on the lookout for some changes in the near future. And in the meantime, if you've got any questions or comments, feel free to get in touch with me at contact@rawscripts.com. 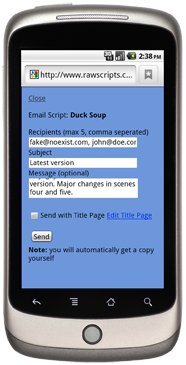 Now, when writing, you can change the script's font size to make things larger and easier to read. In the toolbar it's a simple click to give you control. Zooming in is an oft requested feature, so we're happy to offer it, and hope this makes writing a little easier on the eyes. Also, keep in mind, if there's something missing that you want, make a stink about it. You can add your ideas to our issue tracker, or the mailing list, and keep bugging us until you get what you want. It's one of the best ways to make the software better. Or, if you're into such things, create your own features. That'd be pretty cool too! 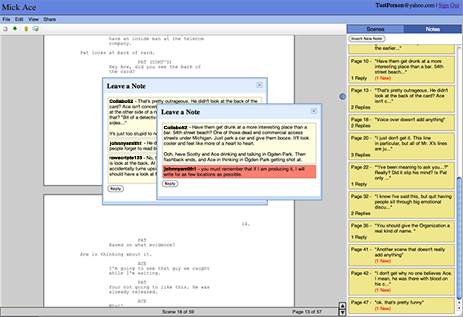 While we hope you never noticed, RawScripts' screenwriting software uses a lot of cutting edge web technologies. We have to. It's how we can provide a user experience as good as any desktop application. But that meant that the service didn't work as well as we'd like in some older or less popular browsers. So, we're pleased to announce that today we're rolling out a better, faster, (identical looking) writing experience that'll work even if you've been putting off updating Firefox for three years. You can be sure that you'll get the same writing experience if you're writing at home, on your laptop or at work. And with improved performance, I've even been editing screenplays on my three year old netbook; something I've never been able to do with other screenwriting software. So, if you've been writing, just get back too it. And if you're running an old computer with old software, we've got you covered.